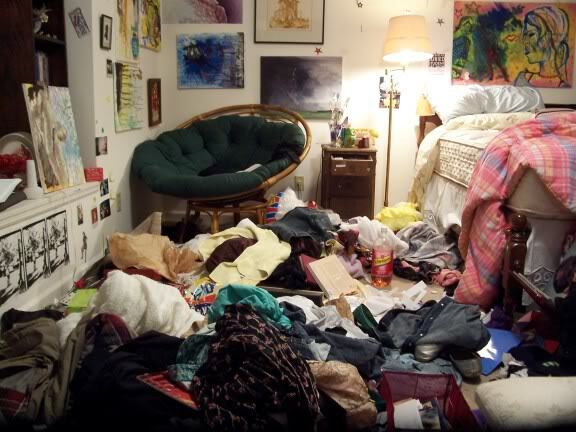 Do you remember when you were a kid and your room would be a complete disaster – and a parent maybe told you to clean your room, and it would seem so overwhelming?! I remember what my mother used to tell me: “start by making your bed.” And it always seemed to help. For some reason, that made the daunting task of cleaning the cluttered room actually seem possible. Why? Looking back, maybe that’s the most noticeable thing in the room? Maybe it’s a mind-game that perhaps if I can make that look all neat and clean, then it gives me motivation and fortitude to tackle the other, smaller piles and messes? Or, perhaps, it’s because that’s the easiest mess to start with. I sleep in the bed every night, so therefore it’s the easiest thing to fix right away cuz it hasn’t had time to acquire piles on top of it. After making my bed, it always seemed that the room eventually got cleaned up, as long as I stayed focused on finishing what I started. -Go to World Vision and decide to sponsor a child. For only $30 a month, you provide meals, healthcare and an education. That’s about $1 a day! -Instead of spending so much on cable TV or Dish, opt out for a lower bundle and use the amount of money you would spend every month saving to go on a mission or humanitarian trip, or donate to a cause of your choice. -Use moments and opportunities that present themselves to you as a moment to trade. My brother started a website called Trade for Freedom. You can check it out at www.tradeforfreedom.org. In it, he wants to use different things in his life to trade for the freedom of a human being. For instance, instead of getting a certain drink he likes, he’s going to put that money toward International Justice Mission where a slave can be freed. He had a moment this past weekend where someone vandalized his car, and instead of buying the hood ornament (about $40 on ebay), he is donating that money to IJM – he’s trading for freedom. As he puts it, “I don’t want to just send money off and not have to be too closely involved. I want to be closely involved. I want to make more of an impact and to understand more and just be the change…What if I take something I don’t really need to get, and every time I would normally buy that instead I trade it for someone’s freedom? I suppose that is still donating, but I feel it’s different when there is great love behind it. And a way that we can do something really small, with great love is to trade something really small, for the freedom and rescue of a hurting lost fellow human. And it doesn’t have to be money. If I have an old computer I’m not using anymore, I’m going to sell it and donate the money to those who are on the front lines. Yes, I would love to be on the front lines. But until I can be, I can do this…I can trade for freedom.” Join him, or start your own unique journey. These are just a few ideas. The message is clear – start somewhere, and like my mother meant when she told me to “start with making your bed”, start in the easiest place that you notice right now. And remember: It’s “Small Things with Great Love” that change the world, one step at a time. What are some things you’ve done to start living a lifestyle of love? Such beautiful and pure wisdom here. Thank you for this…I really needed exactly this today. You continue to inspire me and I’m so proud to call you sister.